Andrew McNeese of Garfield looks over fish he bought Wednesday Nov. 7 2018 at Webb's Feed and Seed store in Pea Ridge from Tracy Jackson with the fish company, Arkansas Pond Stockers, Inc. McNeese bought hybrid bluegill to stock in his pond so he can fly fish for them. 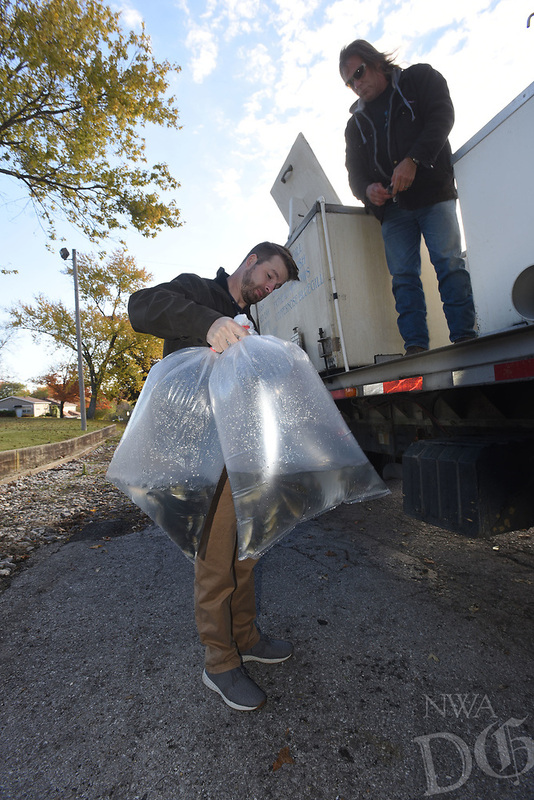 Arkansas Pond Stockers of northeast Arkansas stops at the feed store in downtown Pea Ridge once a month to sell fish for customers to stock their ponds and lakes. They sell hybrid bluegill, catfish, grass carp, minnows and other species.